If you purchased goldfish because you believed them to be low-maintenance pets, you're in for a shock when their tank starts smelling. These little guys can produce an impressive amount of waste, and they aren't the neatest eaters, either. As food scraps and fish waste build up in your fish tank, the water begins to stink. A thorough cleaning and a partial water change should be enough to reduce the odor and improve the health of your pets’ environment. Vacuum the gravel at the bottom of the tank to remove as much waste as possible. Even if you have an under-gravel filter, it's still possible for pieces of uneaten food or fish waste to accumulate on the bottom, causing odor. Scrape algae from the sides of your goldfish tank using an algae scraper. A touch of algae usually isn't a problem, although it may impair your view of your fish, but a lot of algae is a symptom of poor tank hygiene and can contribute to bad odors. Perform a partial water change to reduce the odor in your goldfish tank. Remove about 20 percent of the water with a siphon hose, and then replace it with fresh water that has been treated to remove chlorine and chemicals. Continue making partial water changes every day or two until the odor is gone. Removing too much water too quickly can distress your fish. Remove one or more fish from your tank. A good rule is to keep one inch of fish per gallon of water. If you have more fish in your tank than that, it's time to invest in a larger or second aquarium. This is especially true with goldfish that need ample space to swim and produce a lot of waste. Change the cartridges in your filter and check to make certain you are using the right filter for the size of your tank. You may need to invest in a new filter. 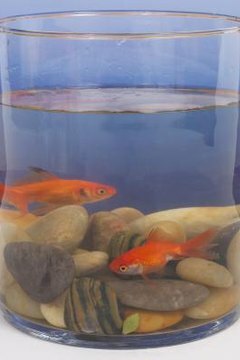 If your goldfish live in a bowl or tank without a filter, continue moving them to a new home. Check the levels of nitrite and ammonia in your tank using a testing kit purchased from your local pet supply store. If these levels are dangerously high (nitrite should be below .25 ppm and ammonia should be nearly nonexistent), perform a full emergency water change to restore the tank to health. Add snails or other creatures that feed on decaying organic matter. These will help keep your tank clean and odorless. Before purchasing, research any new addition to your tank to make certain it's compatible with your current fish.  A common cause of fish tank odor is waste from overfeeding. Only feed your goldfish what they can comfortably eat in about 10 minutes. RSPCA: How Should I Keep and Care for Goldfish?